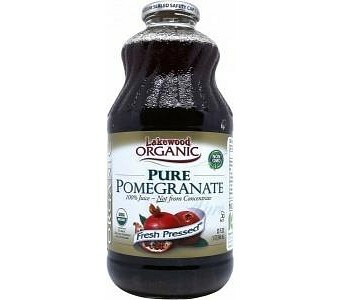 Made from 100% organic pomegranates, Lakewood Pomegrantate Juice is is pasteurised and vacuum sealed in glass bottles. Pomegranates contain the anti-oxidants phytophenols which help fight against cardiovascular disease, high blood pressure, Alzheimer's, stroke, lung and prostate cancer. They also contain vitamins A, B, C, and E, which are known to be beneficial for blood purification and circulation. They also contain high concentrations of polyphenols which have neuro-protective and anti-ageing effects. Ingredients: FRESH PRESSED JUICE FROM WHOLE RIPE CERTIFIED ORGANIC POMEGRANATES. This is a natural, full strength, organic Pomegranate juice - not a diluted product. This juice will settle and juice solids will form at the bottom of the bottle. Shake well to enjoy the complete nutritional value of this juice.